This bug was photographed on Burro Bush (Hymenoclea salsola) where it commonly feeds on new growth and developing flowers and seeds. Rackensack Canyon, Maricopa County, Arizona, USA. 3 Aug. 2008. These large, conspicuous bugs are over 10 mm in length as adults. They feed using piercing-sucking mouthparts and are classified as true bugs, order Heteroptera. As such, their food consists entirely of liquid extracted from plant tissues. Their feeding is concentrated on the most nutritious parts of plants such as flowers and fruit. 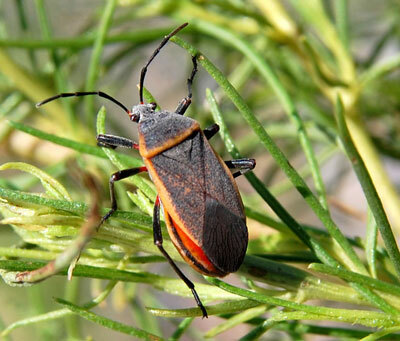 Largus bugs can be found on a variety of plants especially in the asteraceae. Two or three similar species may be represented in the Sonoran Desert. The nymphs (immature stage) lack fully developed wings. Their color is metalic blue with an orange, warning triangle at center. Conspicuously aposematic reflecting the noxious chemicals that would be released if the bug were snapped up by a bird, for example. The nymph at right is feeding on fruits of Desert Globe Mallow (Sphaeralcia ambigua).